Traveling really ruins your rhythm. I swore to myself that this time I went out of town, I would write up all my blog posts and have them publish automatically while I was gone. When that didn’t happen, I said that I’d find time to write some things while I was visiting my family. We were at the Open Space Visitor Center in Albuquerque, taking a nice nature walk. There happened to be an exhibit on weaving and fiber there that was very interesting. There was even a loom to play around with, with fibers donated by a store called Village Wools. Crazy coincidence, eh? 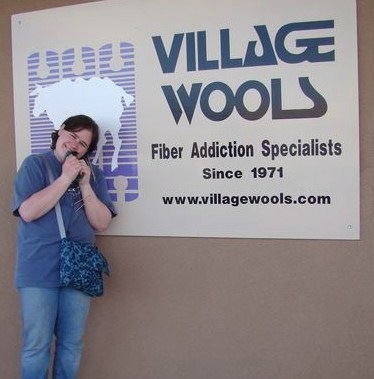 Their tag line is “Fiber addiction specialists.” After having observed me and my knitting for the week previous, everyone decided that I am certainly addicted to fiber and that maybe I should visit this place to get some help. I was trying to look like a crazed fiber addict by eating my sock, but I ended up laughing too hard to keep the “crazy eyes” going. So now I just look silly. Ah, much better. You can actually see the sock I’m holding. This place was amazing. 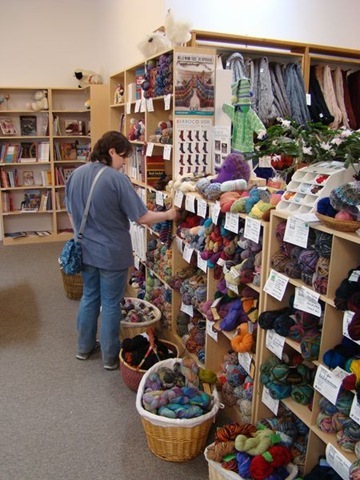 It was by far the largest yarn store that I’ve been in and every corner and surface was covered in yarn or needles or spindles or books. 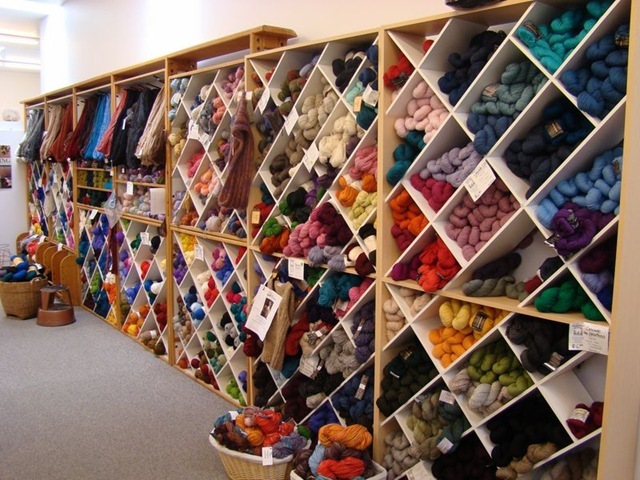 The yarn selection was incredible. Cascade, Misti Alpaca, Noro, Debbie Bliss, Lorna’s Laces, all sorts of yarns in all different weights and colors. Oh, the colors! The book selection was great too, with books on socks, lace, weaving, and spinning. I bought three books, two of which I’d never seen before! Actually, I wanted to buy a lot more books, but I convinced myself to wait until the next time we’re in town. I could have spent hours in that store. 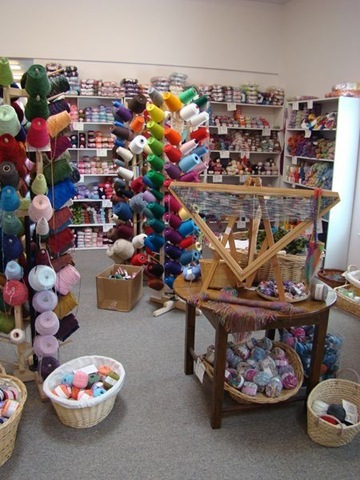 There I am by the sock yarn, fondling some Lorna’s Laces. I got a lot of yarn, which I’ll photograph and post up somewhere later. I bought some lovely wool that was hand-dyed in Bernalillo; I always like to buy some local yarn when I travel, although sometimes I can’t find any. I was also gifted with a drop-dead gorgeous skein of wool/silk in teal and blue that I have no idea what I’ll do with, but it will have to be fabulous! The yarn deserves nothing less. Oh my gosh, this stuff is incredible. 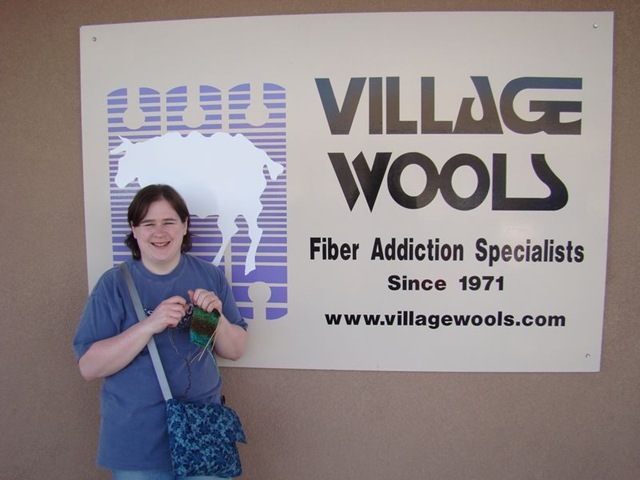 If you live in the Albuquerque area and haven’t been to Village Wools, then you’re obviously not a fiber addict. This place is great. 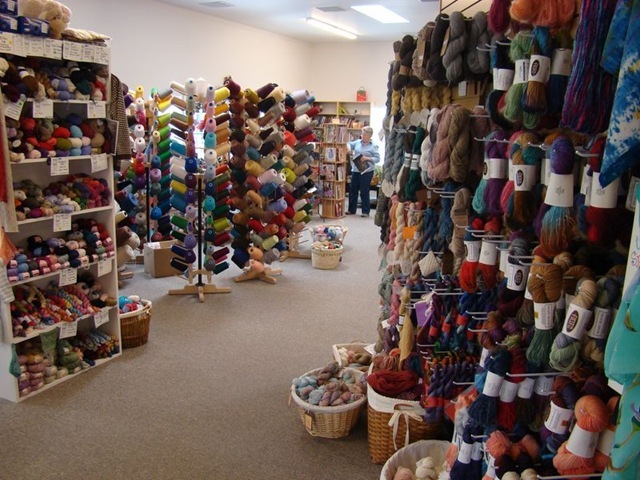 Now I’m not sure if I go to New Mexico to visit my in-laws or to visit Village Wools! omg! Can I come next time? I won’t be any trouble to your in-laws. 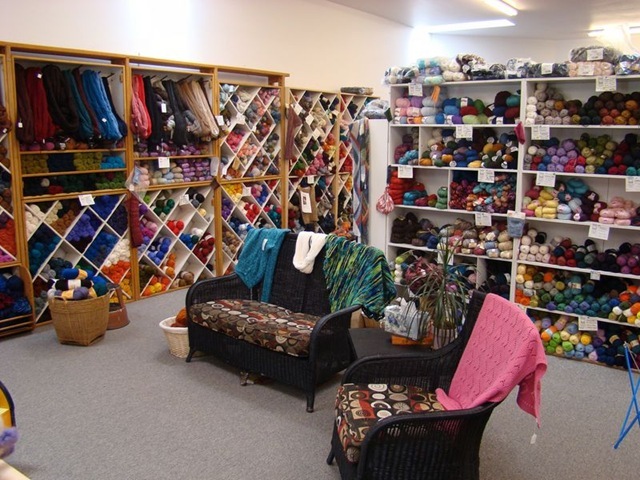 Honestly, I’ll even sleep at the yarn store if I can! *bounce bounce bounce*! I’m so jealous!